Discussion in 'General Chatter' started by Lauz_1601, Nov 8, 2006. Lunch - Sandwich, 2 cocktail sasuages, cheese string, rusk buscuit. Yeh I love the organix stuff for snacks ella loves the crisps. 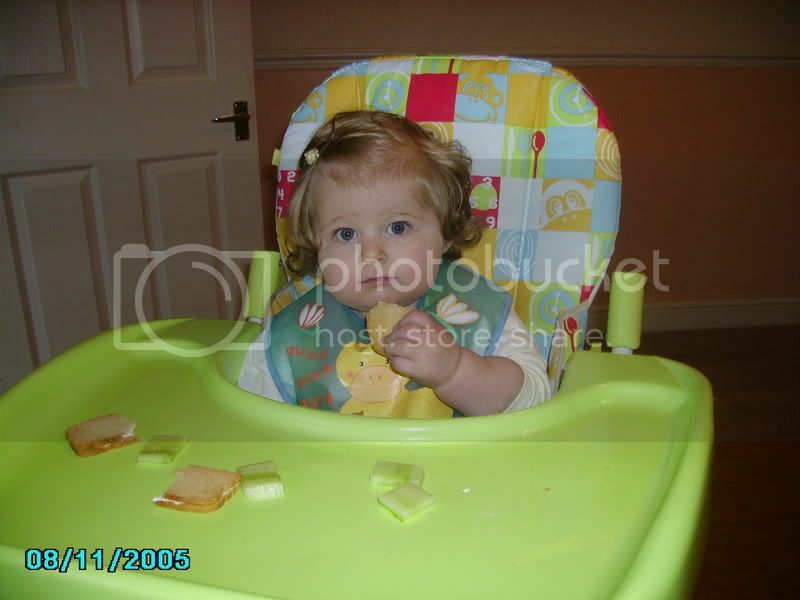 Wow Layla Coby eats alot for brekfast, how many bottles does he have now? Iv just cut out Ella's lunchtime bottle so she has one in the morning and one at bedtime, is that ok or is she too young for me to do this ? Though saying that, the last 2 week he has wanted 1 at about 4 in morning!!! oh good coz I knwo thats what she shud be having at around one and she's fast approaching it! Also she gets lots of dairy throughout the day. You can't eat Ella thats just not a nice thing to do!!!!! PMSL! she is nice and chubby, plenty of meat on her! poor thing what am I saying about my daughter bless her! he has one bottle to go to bed with, and one in the night, they are 6oz ones but he doesnt always drink them. and for lunch she had grapes and pear at toddler group then a smoked ham sarnie and sausage roll.